If you really want to understand the depth of obsession and, shall we say, "differences in opinion" regarding pizza, all you need do is enter that single word into the Youtube search and begin the descent into madness. I, like most everybody in the world, enjoy pizza and will eat it in nearly all of its forms, of which there are legion. However, since I didn't grow up in New York or Chicago, Napoli or Roma, I really don't have a hill to die on when it comes to dough, sauce, and cheese. I know what is good, I know what I like, and I know what Savannah, Ga has to offer. That being said, when it comes to quality and flavor, nothing beats a simple margherita pizza cooked Napoletana style in an insanely hot oven. A few, simple, good things often yield the most memorable product. However, such a pizza was non-existent in the Coastal Empire of years past. I grew up in the Savannah area eating three kinds of pizza: delivery, frozen, or lunch room. 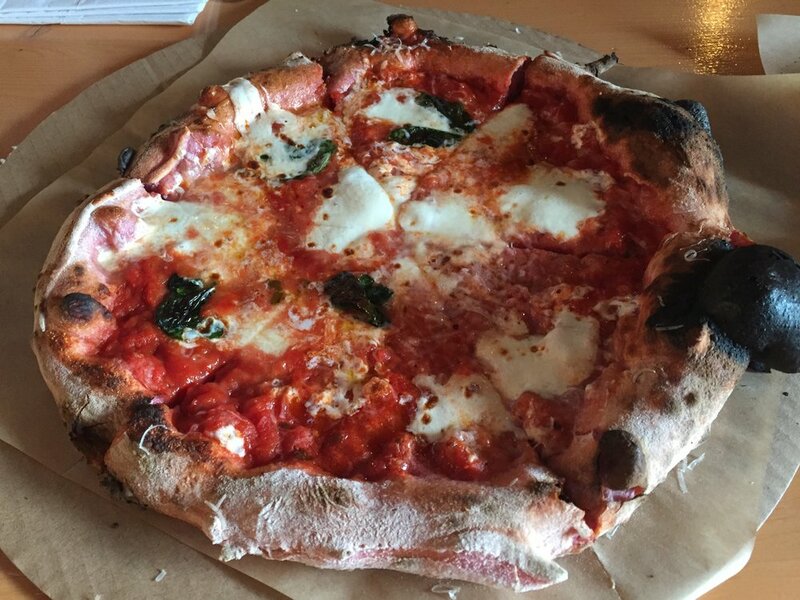 I was well into adulthood and in some far-flung part of the world before I ever even saw Neapolitan-style pizza. To me, as to most of my generation in the South, pizza was the cheesy, pepperoni-covered hallmarks of Pizza Hut personal pan pizzas or the fuel needed to get you through a solid gaming session at Chuck E Cheese (formerly Showbiz.) Since that time, I have grown to appreciate pizza to a considerable level of refinement, but in all fairness I don't turn my nose up at much. Savannah has a few standbys as far as pizza is concerned, but I am not concerned with said establishments. Vinnie Van GoGo's is fine, but the fact that it is and has always been cash-only means it is almost never on my radar. We ate there in high school because what else were we going to do downtown? The wife and I prefer Screamin' Mimis, which has its own subtle charm of serving slices that are bigger than the paper plate they're served on, but at the end of the day it doesn't excite me. Green Fire pizza falls into this same category of, "competent but not worth going out of your way." If you've read any of this blog you know that my favorite pizza, or favorite food in Savannah almost, was the pizza to be found at The Florence. 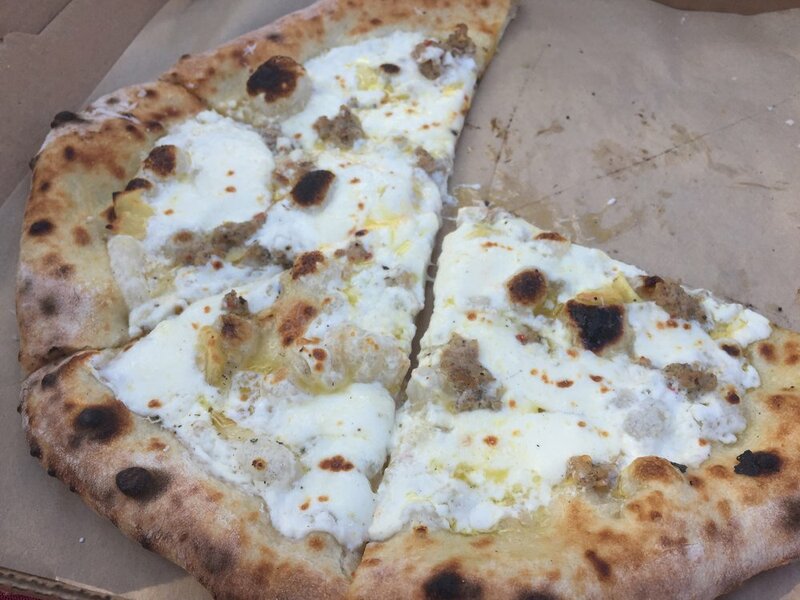 At happy hour you could get a pie for $10 that was made with the love, care, and attention of a Renaissance painting. Sadly though, like the Renaissance, that restaurant and all its fine joys are relegated to history. For a while I despaired. I tried other pizzas in other restaurants in town that claimed to be "authentic Italian" and always walked away disappointed. This is not a chronicle of that sad time, however. No, this is the herald of a new and exciting era of pizza-dom in the Coastal Empire. This prose is dedicated to Big Bon Pizza. Big Bon's trailer-mounted, wood fire pizza oven. Big Bon has a pretty good story behind their appearance in Savannah, a story no doubt soon to be featured on some TV program or another. 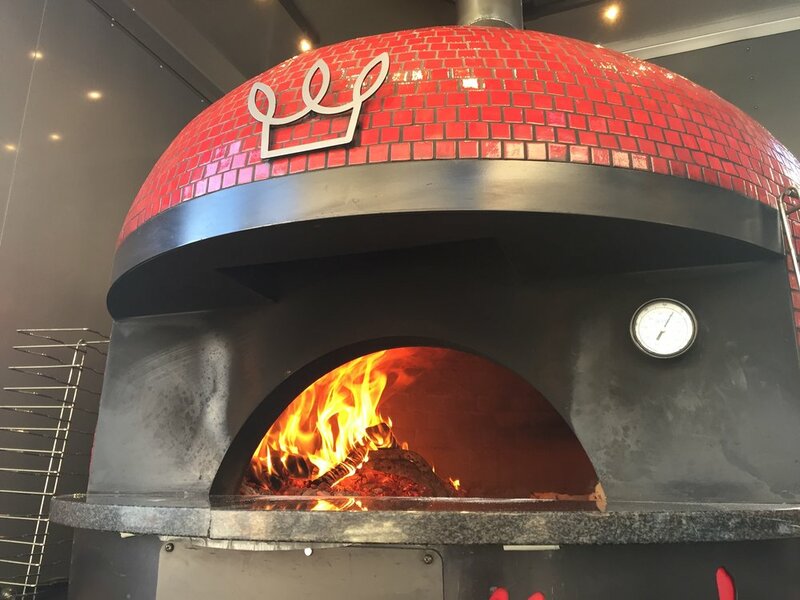 Without going too much into it: family owned and operated, Korean-American, with a catering background, they ran a successful kickstarter campaign about two years ago to get a woodfire oven that they then...put on a trailer? Indeed, Big Bon is mobile and that alone makes it unique. You can't really call it a food truck, because it's more of a catering operation, but it certainly lives in that world. The owners have not only embraced the mobility of their operation, they celebrate it. 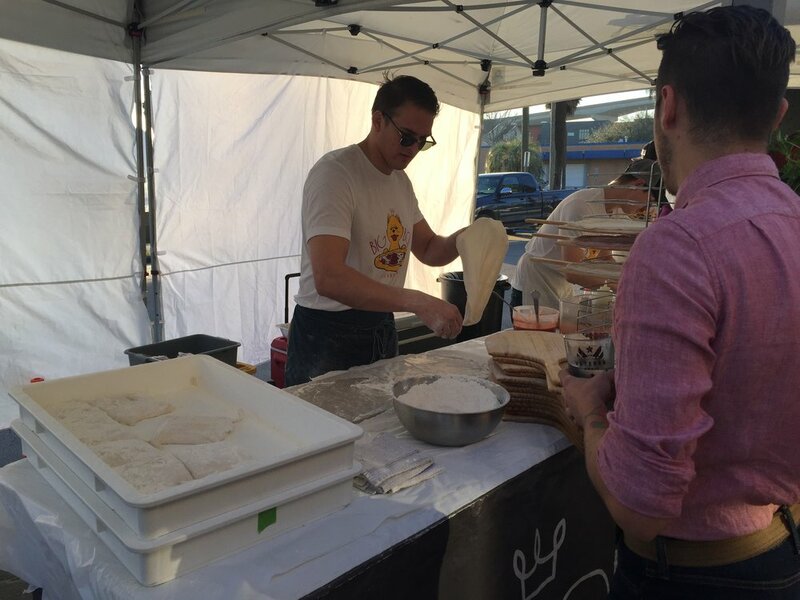 They have been partnering with other local business all around town to host "pop-up" events where they sling their pies alongside the likes of Service Brewery, Back in the Day Bakery, and most recently Leopold's Ice Cream. Those are some serious names in this town, and I'd wager to say that if it doesn't already, Big Bon will have that same level of clout before too long. Big Bon is a full operation. The times we've found them they have been set up on the street or in a park with tables, potted plants, tents, the oven trailer of course, and sometimes even tables to eat your pizza upon. You walk up to the "reception", order your pizza and pay, and then the process begins. The dough is taken out and spun to shape, sauced and topped, then passed over on the peel to the oven where it is baked. In a matter of minutes the pie is cooked, boxed, and handed right to you. Usually they give you a number and then call your name when it's ready. Once all of the dough is gone, the show is over. The pizza itself is very much in the Neapolitan tradition, and if you simply go with the margherita, you will be more than satisfied. It is a perfectly executed example of the style: dough, sauce, mozzarella, basil and finished with grated pecorino. The wood fire oven cooks the pizza in seconds, leaving a chewy texture to the dough and a nice char on the crust while perfectly melting the cheese and cooking the other toppings. It would be enough to stop there, but you shouldn't. Their signature Big Bon Original adds three pork products to the party: pepperoni, local sausage, and bacon. The 'bianca' is a cheesy, garlicky wonder, and even the owner's Korean heritage gets full expression in a eye-catching kimchi-topped pizza. 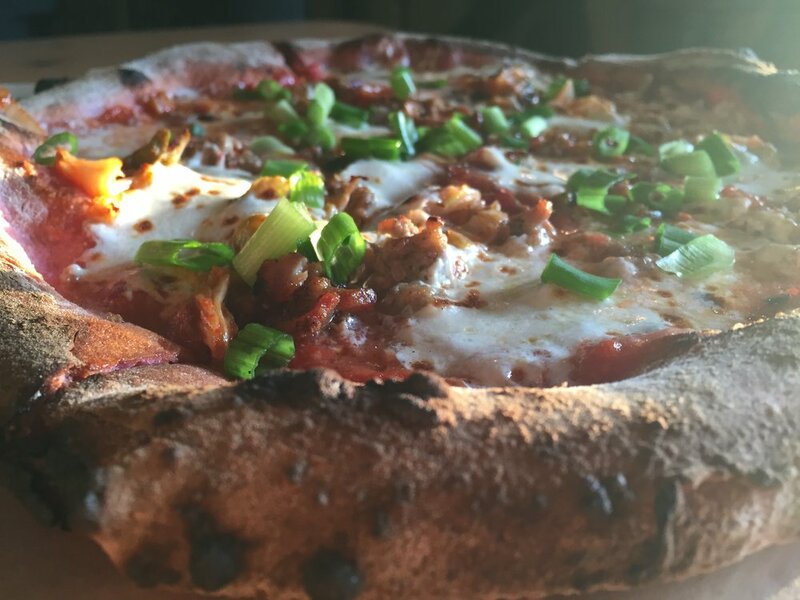 Named the Kimchi Mama Bon, the pizza is an impressive example of how disparate parts can unify to transcend their individual components. I'd wager a lot of folks in Savannah, if they even know what kimchi is, would not ever think to put it on pizza. Yet, when combined with sausage and bacon, red sauce, mozzarella, and scallions, it lends itself to a unique and satisfying crosscultural pizza experience. In otherwords, it's America that you can slice up and eat. 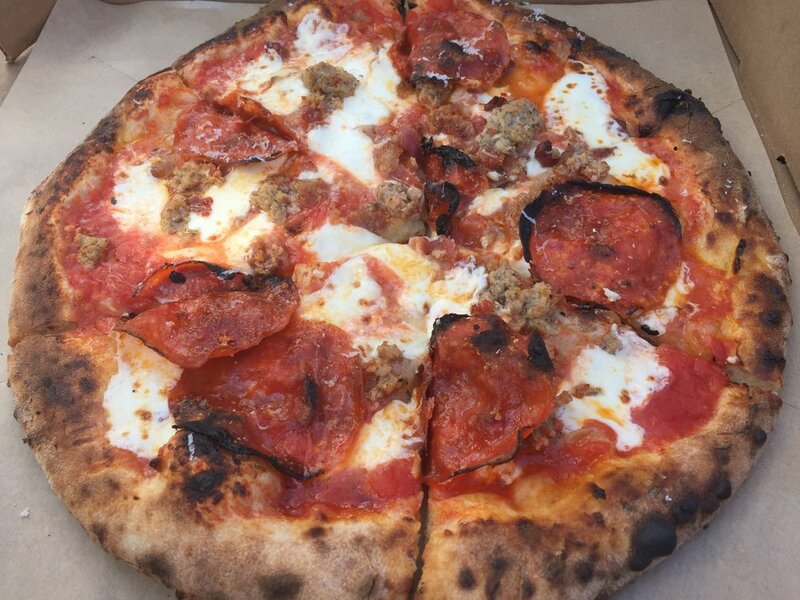 The pizza alone is one of the most excellent things to eat in Savannah, but when it is taken out into the world and allowed to play with friends, you have yourself an event. On Valentine's Day this year, Big Bon set up shop outside of Service Brewing. Everybody involved went hard into the theme: there was live music, a special chocolate and cherry dessert that was offered alongside a one-off Service stout that had cherries in it, and Big Bon even dyed their pizza dough pink for the occasion by using beet juice. The beet didn't affect the flavor, but it made the dough look occasion-appropriate. For dessert, Big Bon also offered little baked pockets of Nutella covered in powdered sugar, because Love cancels out calories on February 14th. Pink dough for Valentine's Day. There have been other pop-ups that worked, like with Back in the Day Bakery where you could grab pizza and a sweet treat (I got one of their cookie sandwiches that fills buttercream icing between two of their incredible sea salt-topped chocolate chip cookies). However, the most culinarily successful collaboration to date was the recent pop-up with Leopold's Ice Cream in a grassy lot behind their old, vacant location on Habersham and Gwinnett. Pizza and ice cream belong together, as any 8 year old will tell you on his birthday, and when you combine Savannah's best of both worlds in the sunshine in seventy-degree weather on a Friday...well, amigos, you've cracked the code. In the time it took me to get out the camera, a quarter of the pizza disappered somehow. Caramel Macchiato, with Savannah Socialite beneath it: the perfect ending.